Bells were ringing and we were singing at Cronulla Library's Xmas Beach storytime on Friday 16th December. Our special storytime in the Mall attracted 60 people who were happy to enjoy Christmas and seaside themed stories and songs. 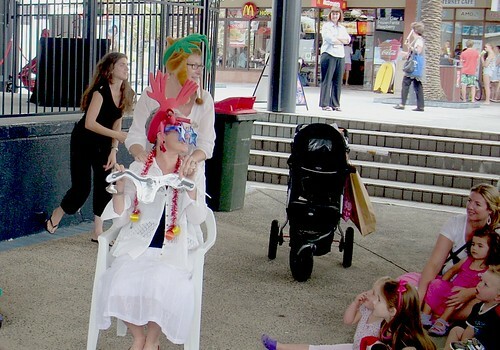 Christmas Beach Storytime in Cronulla Mall, originally uploaded by Sutherland Shire Libraries. 'Maudie and Bear' from Bookweek 2011, and our enthusiastic singing attracted the attention of Santa who came to say hello. Bookatoo also visited much to the delight of the crowd most of whom were our regular Storytime and Rhymetime customers. So a very Merry Christmas to you all and we hope to see you at Cronulla library in the new year. Bookatoo and Friends at Cronulla Mall, originally uploaded by Sutherland Shire Libraries.